Mozarella ohne Milch, geht das? Küche, Rezepte Kommentare deaktiviert für Mozarella ohne Milch, geht das? In einer Schüssel Flohsamenschalen mit dem Wasser übergießen, evtl. noch etwas umrühren. Die Cashewkerne in Wasser einweichen (so dass sie gut bedeckt sind). Beides 2 Std. stehen lassen. Das Flohsamen-Gelee in ein Gefäß geben, die abgegossenen Cashewkerne zu den Flosamen geben, alle übrigen Zutaten zugeben und mit einem Mixstab gründlich pürieren. Das war’s auch schon! Die entstandene Masse gibt man je nach Formwunsch des Käses in ein passendes Gefäß, das man verschlossen in den Kühlschrank stellt. 1-2 Stunden kühlen, besser über Nacht. So, meine Käsemasse steht im Kühlschrank, und ich bin gespannt, wie sie schmeckt und wie fest sie wird. Heute abend sind Tomaten mit Mozarella geplant. Ich werde berichten. Nachtrag – Es geht sehr gut – die in der Familie, die Milchprodukte vertragen, meinen, dass das wie gewürzter Mozarella schmeckt, die Konsistenz stimmt also. Auch wenn nicht alles Wasser von den Flohsamenschalen aufgenommen wird – die Menge stimmt so, nicht das Wasser der Flohsamenschalen weggießen. Today I did Joeys challenge. Again the string is a circle, this time with a cross. And she gave us a pattern, B-twixt by Pegi Schargel. This one is new to me, so I started out practicing it first. This is the second try, done in my journal using a 0.5 pen. The designer told us to start big, so I did. This is much easier – especially on the eyes – than using a 0.1 pen. This is without shading, and you see that I tried several variations; two fillings are done with a 0.1 pen. This was really fun, and I’m going to show you the shading in another post, whenever this page will be finished. 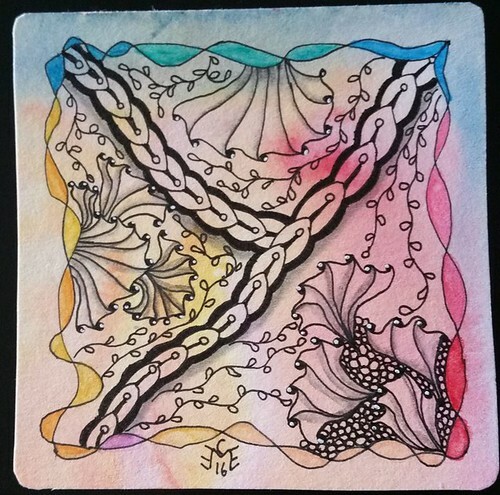 Then I used my Pilot Frixion pen for this tile – done on simple printer paper. I love those pens, because they glide over the paper very smoothly. They don’t have fully opaque ink I love to write with them, and I love to draw with them. As you see, I did different variations than in my exercise. One was in the artwork accompanying the stepout, the one with the dark background. The other is in the exercise in baby stage, now I made bigger spirals to fill the space. All in all this is a beautiful and versatile pattern. It is also a woven pattern, a category that I really love. So it wasn’t difficult to find two more patterns to combine. 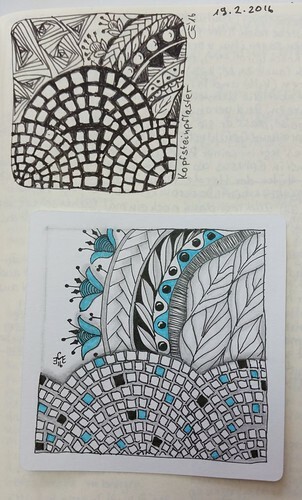 The first is Huggins, which is from Zentangle HQ, and the other is Y-Ful Power by Shoshi. The former is an old cherished pattern, the latter is one I have wanted to try for quite some time, but never dared. But it was easier than I thought it would be. I used shading by lines, because I don’t like the look if you use pencil and this blue color of pen together. The next discipline I tried was a duotangle. I’m not sure I did one before. Yesterday I saw Zavatar 2, and fell in love. Easier than I thought, and doable with the stepout. There is also a video showing how to do this. 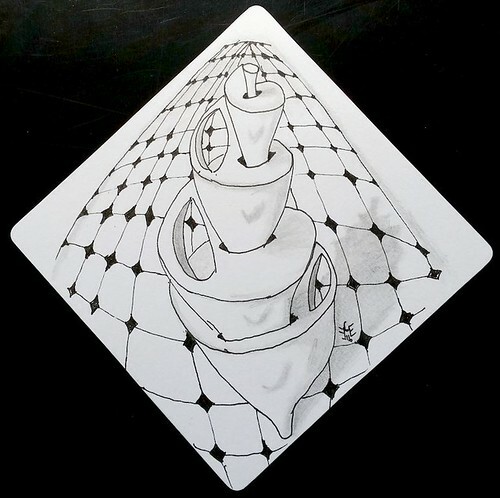 This tangle makes a typical central focus for a tile, and I felt this wouldn’t work as a monotangle. So I decided on one of my go-to tangles, Florz. I didn’t use a frame, but a string to help me draw Zavatar. 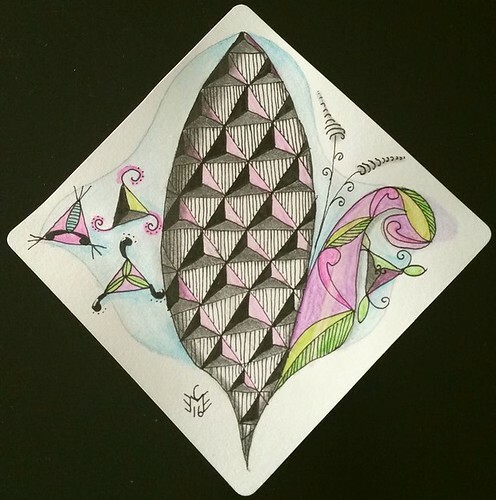 Loved this one, so much fun to draw this tile. I’m sure I’m going to practice Zavatar 2 some more, and I’m already thinking about which other patterns to combine with it. Although I’m not really a beginner I learned a lot from each of the tiles. So much fun, so I decided to use string no. 1 from Pattern-collections to fill with tipple. Again I used a background I had in my stash, but this time it was painted with watercolor. I used pen and pencil, plus a bit of colored pencil. Then there was the challenge #26 at the Monotangle group, and they chose the pattern Aim plus string 111 from tanglepatterns.com.. This time I only used a bit of glaze pen to add some color. So this is my third monotangle. (Deutscher Text unter dem Bild). I almost made it in time this week for Diane and Carolien’s Alphabet Challenge, but the new one is up already. I’ll still share my A-Y-K challenge. I used the patterns Anglefish, Y-Chain and Kelp to make this tile. 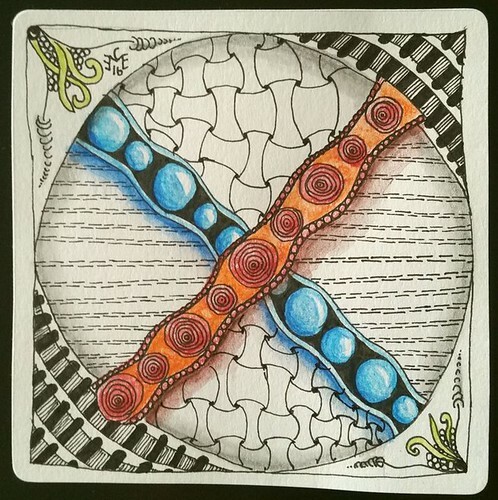 The frame tangle is Twisted Ribbons by Susan McNeill (from a book). Other than that I threw in a bit of tipple. I drew a string in Y-form. The background is watercolor (I have had the watercolors for a very long time, they are good quality, and I make backgrounds with a big brush), and for coloring in I used watercolor pencils and a brush pen. 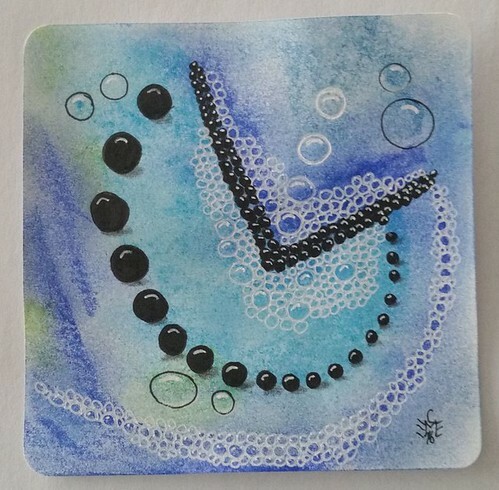 The tile is cut from watercolor paper, this has also been in my stash for a looong time. Der neue Challenge ist schon erschienen, aber ich möchte euch trotzdem den für vergangene Woche zeigen. Die verwendeten Tangles sollen mit A-Y-K anfangen. Ich habe Anglefish, Y-chain und Kelp für meine Kachel verwendet. Der Rahmen ist Twisted Ribbons von Suzanne McNeill (aus einem Buch). Ansonsten hat Tipple mal wieder Anwendung gefunden. Ich habe einen ypsilonförmigen String gezeichnet. Der Hintergrund ist mit Aquarell-Farben gemalt (die habe ich schon fast ewig rumliegen, sie sind von guter Qualität und ich mache jetzt mit einem dicken Pinsel Hintergründe für meine Tangeleien. Die Kachel habe ich selbst aus ebenso altem Aquarellpapier geschnitten. Joey challenged us last week with a circle with an x, and Girdy. Good to showcase borders, I thought, and so I used my own patterns Gemütlichkeit as center and Fluvius in the background. Sorry, Girdy only played a small role here, but well, that’s how it works sometimes, you find it on two corners. I added well-loved Huggins for the second background pattern, and some Swirls and Zingers to the corners that were left. Joey hatte letzte Woche für uns einen Kreis mit einem X drin, und das Muster Girdy. 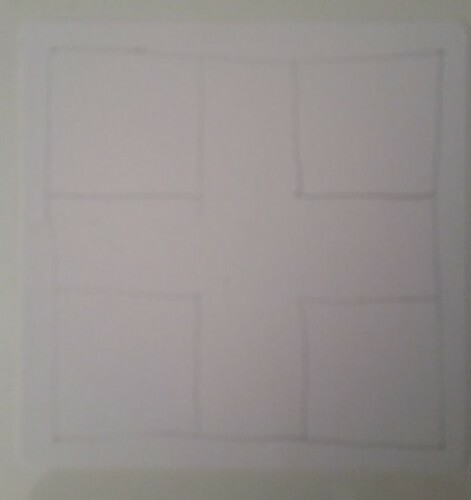 Gut, um Bandmuster zu präsentieren, dachte ich, und so habe ich meine Eigenkreation Gemütlichkeit als Mitte verwendet, und mein anderes Muster Fluvius im Hintergrund. Tur mir leid, dass Girdy hier nur eine kleine Rolle spiel, aber so ist das manchmal, ihr findet es in zwei der verbliebenen Ecken. I habe für den Hintergrund noch Huggins verwendet, einen lieben alten Bekannten, und Swirls und Zinger für die beiden übrigen Ecken. Der Mustermixer ist diesmal eine Kombination (kein Duotangle!) aus Trimonds und Telis. Beide Muster habe ich noch nie gezeichnet, aber sie sind sehr leicht. Als Kombi habe ich Telis als String genommen, und einen Teil mit Trimonds, den anderen mit Telis gefüllt. Dann habe ich noch ein paar Permutationen von Dreiecken gezeichnet, in denen sich beide Muster vereinen. Zum Schluss wollten noch ein paar Zinger ins Bild, aber die wurden auch noch Telis-mäßig aufgepeppt. Außerdem mussten meine neuen Aquarellstifte (gab’s billig beim Kaffeeröster, was teureres ist im Moment nicht drin) mit ran, denn ohne Farbe war mir das ganze zu langweilig. This time we were to do a combination of Trimonds and Telis. 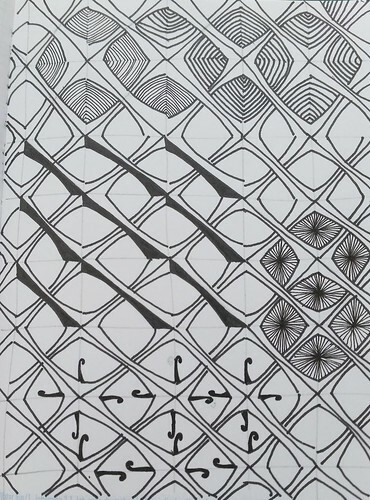 I haven’t drawn these patterns yet, but they were quite simple and straight forward. I used Telis as string, and one part I filled with Trimonds, and the other with Telis. Then I added a few triangles with permutations of both patterns. At the last moment the Zingers wanted to be included, and I added a few telis-spirals to them as well. Also my new watercolor pencils were used (I got them for cheap, but right now I can’t afford a really good set), because without color this felt a bit dull. For challenge no. 273 the Diva asked us to remix one of our old tangles we are not quite content with. I thought for a long time which one to use, especially since I started tangling (or back then it was more doodling) only in February. So not so many tiles to revamp yet. I needed to do a new version, because the old one was in my journal, and I didn’t even use a mircron pen back then. Also it is very small, and very full, so adding to it wasn’t anoption. The new tile used some of the patterns of the original tile, but not all. I even left a section untangled. 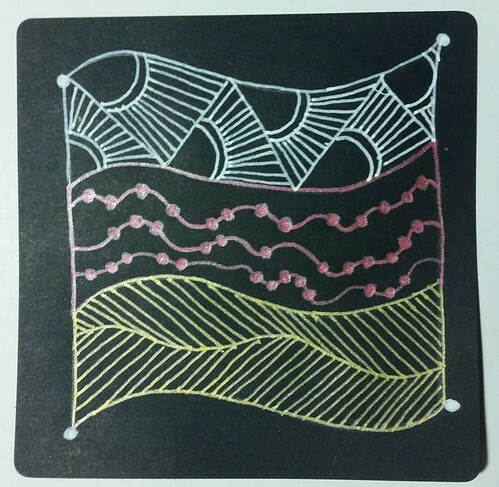 For some of the patterns I found more suitable tangles, like Leaflet. The cobblestone pattern from the streets in our part of Munich is more like the original, which is not such an extreme arch as in the old tile (although this pattern is also found in cobbling, and even in Roman buildings – well kind of). I don’t consider the cobblestone pattern a real tangle, because I needed lots of pencil lines to make it look good. I erased those lines later. Still drawing all the cobble stones was quite calming. The new tile also uses shading and color. The pen used is finer, the tile bigger than the original. I didn’t use Paradox in the new version, because I felt it outcrowded the flower border adjacent to it. I left out a few of the borders to make more Room for the tangle Leaflet. The only other pattern I recognize is Ragz. 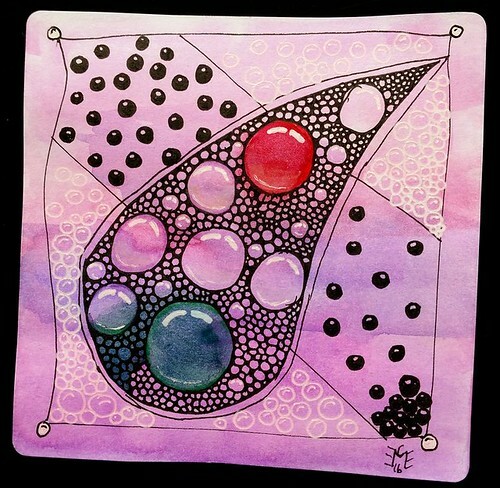 While both tiles use tangle patterns, I wouldn’t call them Zentangles. 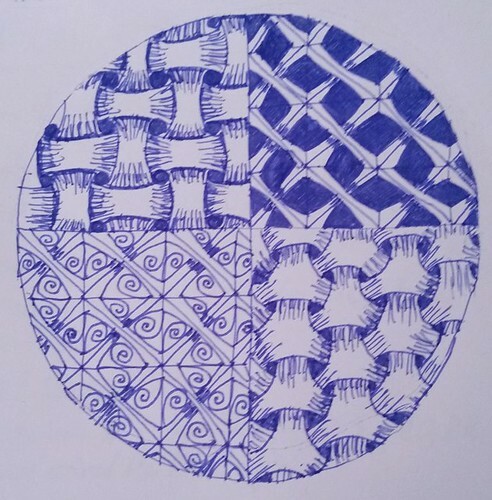 Too much is just doodling, and I don’t consider the main pattern a tangle. The Diva asked us to use our Home Country’s colors, or tangle something with our country in mind. It was very appropriate, because that week the European Soccer (Football) Championship was still in full swing. You see lots of flags and such during those international tournaments in Germany. I’m using the German flag of course, but used a black background, because Germany didn’t make it to the final. But to still be a bit festive I used glitter gel pen for red and gold. I loved how fast this tile was finished. I used Sonnenband (first use), Beadlines, and Meer for this simple and straightforward tile. This tile has a very emotioanl background, the shootings of lots of innocent people of different races in the US. These shootings really shook the US, and most of the people are just yearning for peace. So it was very appropriate to make Peace the topic for this Week’s challenge. I had to think about this for a bit, and it also took some more time than usual to execute. This is the string (sorry for the bad photo, but I tangled when it was already dark. I didn’t want to wait till next morning to start drawing). This is the first time for me to use a word to choose the tangles. My tangle is not the Word Peace, but Jesus. Jesus Christ is called the Prince of Peace in the Bible. While his mission was to bring Peace between God and man, a person who knows the peace of God in her life will bring also peace to her sourroundings. So where Christ and His word is really followed, there will be peace among people as well. Many suppressed people found peace in faith to Jesus, from the Afro-Americans to the Dalits in India. That’s because before God all races are equal, as well as there is neither slave or master, nor man or woman, before God. So I used the tangles (J)oin, which I find really appropriate to the topic as well, as it is made up from hearts with two very different halves. For me this tangle shows that love will help to bring together diverse people. The second tangle is (E)ddyper, which is a very lively tangle with lots of energy. I used it as a contrast to the more gridbased other patterns. If we all would use our energy for peace, what good could be done! 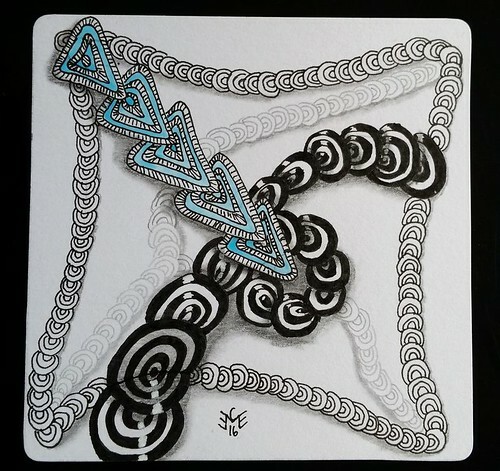 The third tangle is (S)evaw, looking like the water of life with all those flows and bubbles. The fourth tangle is (U)nbatz, and I thought it would signify the dead we are all mourning. It looks a bit like crosses on a cemetry. That’s why I added no color in this part. 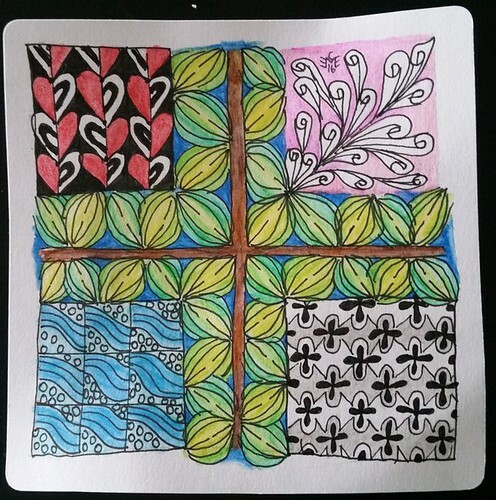 The last tangle I used is (S)prigs, and I found it a good way to fill the cross. It is very organic, and signifies resurrection, and new life. Because it is also somewhat grid based it was ideal to fill the cross. Exept for Eddyper, all tangles were new to me. Für die Wäsche beim Waschgang: 75 g kristalline Zitronensäure auf 1 Liter Wasser.